What is it: 30 Pack of 100% Biodegradable fabric used to eliminate body odor before and during the hunt -- and residue from your hands after the hunt. How it works: Scent Kapture Field Body Wipes have a proprietary blend of odor eliminating ingredients designed to reduce human odor on the skin. 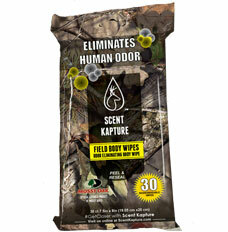 Bonus Uses: Use After the Hunt and Scent Kapture Field Wipes for your hands when you do not have water to wash your hands after field dressing or even fishing.